Uhhhh, November. My “catch up to all the books I didn’t read in October” month. Can you hear the loud sigh coming out of me? I didn’t mean for my TBR to run away from me, but it did. Uhhh, my life wasn’t kind to my books or my reading abilities in October. I spent majority of the month in a reading slump because stress refused to let me focus on reading. It felt quite weird to not be reading; it sucked. From the eleven books I wanted to read last month, I’ve finished four of them, and started on three of them. The four I finished were: Gertie’s Leap to Greatness, Demon Vol. 1, Tetris: The Games People Play, and Iron Cast. They were all wonderful! Highly recommend all of them. The three I started were: This Adventure Ends, Rebel Genius, and The Infinity Years of Avalon James. I never got around to reading Crooked Kingdom, Foxheart, or Finding Perfect. I’m saving A Monster Calls for closer to when the film comes out. Currently reading: This Adventure Ends (this has been really delightful to read! ), The Infinity Years of Avalon James (Still at the beginning but excited for the friendship! ), and Rebel Genius (renaissance + art). A Monster Calls: Want to be prepared for the film! Finding Perfect: Middle Grade about OCD with the main character into slam poetry. The Secret Life of Lincoln Jones: I love that Lincoln’s safe place is his stories! Jess, Cunk, and the Road Trip to Infinity: A trans story + friendship + roadtrip + learning about oneself, I’m in. Gap Life: What goes on during a gap year? Note: All these books here do not account for other books that may slip into my TBR list (because mood reading will probably happen) nor of the comics I will be reading. I’m sure I missed other books I want to read this month too, but since I can’t remember, it must not be priority, right? Let’s hope I make a dent in my TBR books for November unlike October! I’m so happy to see that you’re enjoying THIS ADVENTURE ENDS! That book is wonderful. Also, I still have to read Rebel Genius. How are you liking that one? 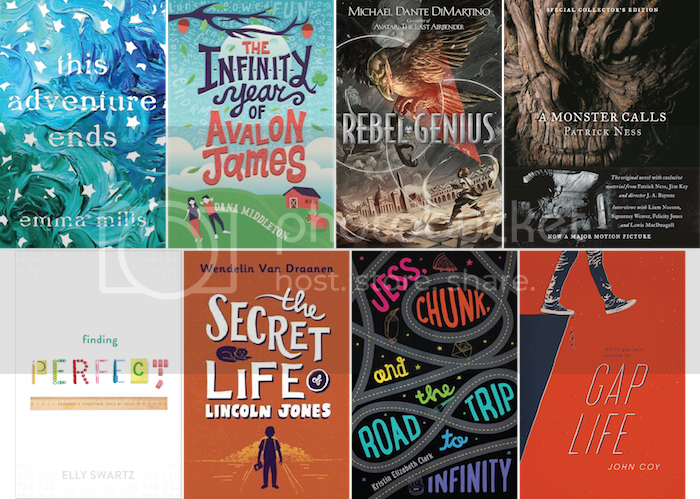 A Monster Calls is on my TBR,too! I have heard such good things. Stress and reading have a funny relationship. It’s easy to get too stressed to feel like you have the time to read, but at the same time relaxing and reading is exactly what you need to destress. Life!